The typical layout of a bathroom sees the shower tucked neatly into the corner of the room, an economical use of space and attractive way to present the bathroom. For this reason most shower enclosures are designed for the corner of the room. In some cases however, the shower either by design or necessity cannot be placed in the corner. Perhaps there is already a sink at one end of the wall and a window at the other, perhaps there is a towel rail in an obtrusive position or maybe a shower would just look better placed in the middle of the wall. Whatever the reason, sometimes the traditional corner design for the shower simply won’t cut it. In such cases, what is needed is a non corner shower enclosure also known as a three sided shower enclosure. A shower that can be placed along the wall, maybe in the middle, maybe to one side, but not in the corner. 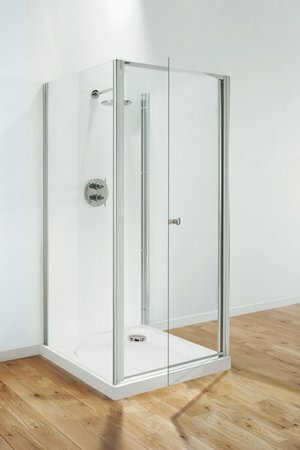 The need for a shower that can be placed along one wall, rather than in the corner, is not uncommon, but it is often surprisingly difficult to find suitable three sided shower enclosures. Here at MBD bathrooms we are aware that bathrooms come in all shapes and sizes and that our customers often have to adapt to all manner of bathroom layouts. This is why we have a wide selection of non corner and three sided shower enclosures, offering convenient and stylish solutions for anyone interested in alternative bathroom layouts. Our warehouse in Tyseley, Birmingham is the largest in the Midlands at 15,000 sq feet and carries a wide and impressive range of stock, far more than what is displayed on our website, capable of catering to just about any bathroom need. Please take a look at our non corner and three sided shower enclosures from the leading bathroom brands in our online catalogue, we are confident that you will find something suitable. If you can’t, please do contact us at 0121 603 8232, we would be delighted to help you find the perfect shower for your bathroom.